Nonunion radius and ulnar fractures, application of bone healing electromagnetic coil over the cast. Referred for a second opinion. A nonunion is a medical condition in which a broken bone is unable to heal properly. Whether surgery or a cast was used to help heal the broken bone, nonunions may still occur. For this reason, all patients could potentially experience a nonunion after breaking a bone. It is important to attend follow-up appointments after initial treatment or if pain and weakness are noticed long after the expected healing period. Broken bones that do not heal, or do not appear to heal in the customary time, are called nonunions and require medical attention to help the bone properly heal. Nonunions are a possible complication of a broken bone. In other cases, nonunions can occur if blood supply to the area is poor or if it has been damaged at the time of injury. Different bones in your body have different levels of blood supply – they are living tissues. Signs of a nonunion include pain, swelling, and weakness affecting the area where the break occurred. Your orthopedic hand surgeon will have given you an expected window of time during which the broken bone generally heals. This can span anywhere from a few weeks to a few months. If a nonunion is present, the pain can be persistent or occur only when the affected limb is being used. If you are noticing discomfort after the standard recovery period, you should seek an examination from a qualified, orthopedic hand specialist like Dr. Jason Pruzansky and Dr. Mark Pruzansky of HandSport Surgery Institute. When treating nonunions, there are several available options. Nonsurgical treatments can involve what is called a bone stimulator, which uses ultrasonic or pulsed electromagnetic waves that stimulate healing in the area. However, this option may not be appropriate for everyone and the bone stimulator must be used daily to be effective. Surgical treatments for nonunions may use bone grafts from healthy bone, either harvested from the patient or from a cadaver, to promote healing. Vascularized bone grafts bring a new source of blood to the ununited bone. Internal fixation, which is where metal hardware is used to stabilize the bone, may also be an option. In some cases, your surgeon may recommend external fixation of the bone. 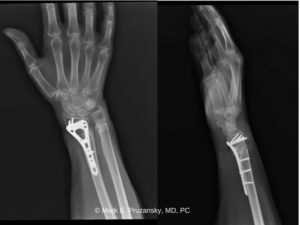 Unlike internal fixation, where metal hardware is placed directly on the bone, external fixation makes use of pins and wires attached to a device around the affected limb to stabilize the broken bone and allow healing to occur. Please contact us as soon as possible to schedule an appointment with our talented team. Call Dr. Mark and Jason Pruzansky at 212-249-8700 to schedule an appointment, obtain an accurate diagnosis, and start the healing process for nonunions so that you can get back to the activities you enjoy.